A Jacob's ladder is a wonderful exotic-looking display of electric white, yellow, blue or purple arcs, which is often seen in films about mad scientists. As a boy I was always fascinated by these in science displays, and as they were often powered from mains electricity it also gave off a wonderful 100hz v,v,voop! busts of sound as well. Please note: A traveling-arc device is very dangerous. The spark can burn through paper and plastic and start fires. Contact with the high-voltage conductors can be lethal even if the high voltage power supply originates from a battery. A Jacob's ladder (more formally a travelling arc generator) is a device for producing a continuous train of large sparks that rise upwards. 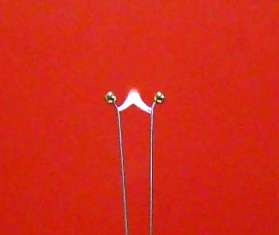 The spark gap is formed by two wires, approximately vertical but gradually diverging from each other towards the top in a narrow V shape. When a high voltage approximately above 10,000v is applied to the gap, a spark forms across the bottom of the wires where they are nearest to each other, rapidly changing to an electric arc. Air breaks down at about 30kV/cm depending on humidity and temperature. When an arc forms it is virtually a short circuit and so the voltage drops and the current rapidly raises and will draw as much current as the power supply can deliver. Consequently some form of current limiting is required to sustain the arc without destroying the power supply. An electric arc is essentially hot ionized air and so it will rise carrying the current path with it. As the trail of ionization gets longer, it becomes more and more unstable and finally breaks. The voltage across the electrodes then rises and the spark re-forms at the bottom of the device. Electrodes that can support their weight and be shaped into a V. Stainless steel rod is good, the resistance of the metal provides more current regulation, it is strong and dissipates heat well. Ventilated glass case to enclose the whole display, this device is dangerous not only electrically it is also a fire risk, plastic burns. Ventilated as it can produce fumes of ozone, carbon monoxide, nitrous oxide and other compounds. The glass case needs a firm base to avoid tipping, lockable to avoide people opening it and more than one emergancy off switch.